Dom joined us in October 2016 with a passion for helping animals. 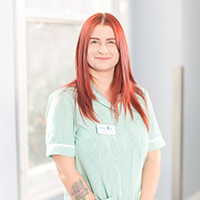 She started working as a receptionist and is now training to be a Veterinary Nurse alongside the Barton Lodge team. She loves interacting with clients and their pets and would love to travel and work with animal charities around the world in the future.